Summer time has well and truly arrived in Farnham and with the rising temperatures comes a rise in warnings about how to stay safe in the sun especially during a workout and relaxing. My name is Hannah Epps and I am a local health and fitness expert from Farnham Pilates. Many will be inspired to get outdoors to get in the best shape possible for the holiday season for example to keep cool I will be running am outdoor Pilates class tonight! 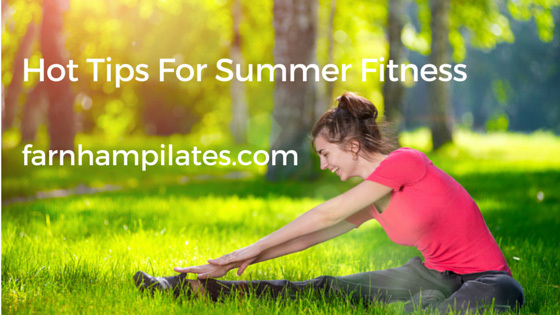 The summer opens up a host of potential outdoor activities like bootcamp, outdoor yoga, pilates, hula hooping, swimming, tennis, running, or walking that seem much more appealing now than in cold winter weather. But how can you maximise your workouts so you can enjoy the heat without wilting away in the hot summer sun? 2) Don’t eat protein before working out it can increase your core temperature and could cause heat shock. You are much better off reloading on protein after you’re done. 3) Lower your core temperature before working by drinking ice based drinks around an hour before exercise or having an ice cold bath or shower. 5) If you work from home try and sit out or walk and exercise within nature, a lovely view can be really motivating. Do something or discover something you really enjoy – exercising releasing endorphins that can really make you happy! 6) And finally, don’t forget sunscreen. Protecting yourself against sunburn, sun-stroke and harmful UV rays is really important and people often neglect the most basic protection which is sunscreen. Even when it is cloudy overhead UV rays can still be damaging to your health so don’t underestimate the power of the sun. Even a 5-10 minutes stretch, yoga or meditation can really lift your mood and be very good for your soul! So do enjoy this lovely weather and continue your fitness development safely. Hannah Epps is building her own pilates studio and a great outdoor space to work out in so If you would like more details about Farnham Pilates classes or one to one assessment feel free to get in touch. • Member of fitpro, reps working in the fitness industry for 20 years teaching pilates for 10 – cyq level 3 pilates, pilates equipment qualified, pelvic floor postnatal expert.